15 Etsy Store Owners. Who got more comments will win a Kiwi Emery Pincushion from me. Here is the First Candidate Joanie AKA What It Seams. After starting my sewing career in 4H Club, well, let's just say MANY years ago, I thought it was high time to put my craft out there. I was bit by the creative bug at a very early age and it still continues to this day. I honestly feel that each and everyday I need to be creative and so this definitely fills a large niche for me. I absolutely love the process of finding that one unique fabric and then literally bringing it to life whether it be an apron, tote bag or quilt. Now you are probably asking yourself, why should I buy from What It Seams? I hope this answers that question for you. 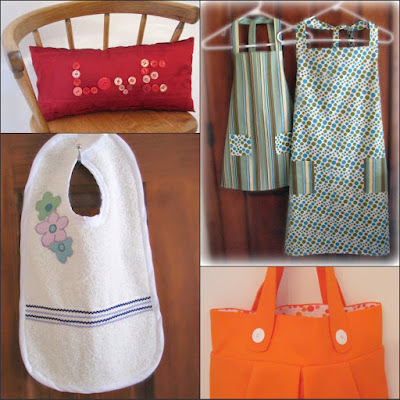 Over the years I have made just about everything you can provided it could be made using a sewing machine from prom dresses, to decorative pillows, drapes, oven mitts, duvets, pillow shams, dust ruffles, tablecloths,and various items of clothing. I even made a suit for my husband once and although it looked great, that is one venue I am not venturing into again. Quilting was a discovery that I made over 20 years ago and I continue to expand in that area. I have a studio/sewing room in my home which has my sewing machine, iron with ironing board, sewing light, worktable and my computer. 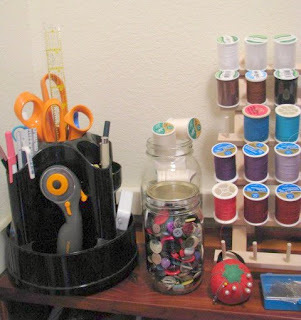 2.How do you organize your materials? Is there any tip that you would like to share with us? There is a walk in closet that is lined with shelves and I also added a bookcase to store all of my supplies and keep me somewhat organized. 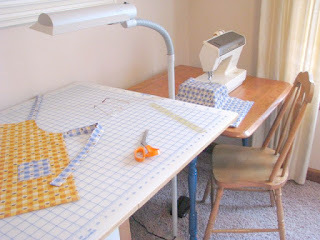 3.How do you prepare to sewing/quilting? First off, I decide on my project, then I choose a fabric and make sure I have all of my supplies, sometimes that involves a trip to the store. Quilts involve a tremendous amount of rotary cutting, sewing of the fabrics and then followed by steam pressing. After the top is completed, I need to layer the top, add quilt batting and a backing and any marking for the hand quilting. I then put the quilt top in my quilting frames, that were made by my ever helpful and supportive husband and start quilting. After all of the quilting is completed, I then add a binding to the quilt. 4.Do you sew after getting the order or forehead? For now, I make my item and then list it. 5.Where/How do you keep your items after you finish them? My aprons are pressed and then hung in my closet, that way they are ready to pack quickly when I receive an order. 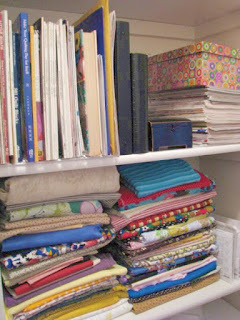 My quilts are folded and stored with tissue paper and stored in boxes to keep them dust free. 6.How do you pack your items and how do you send them? 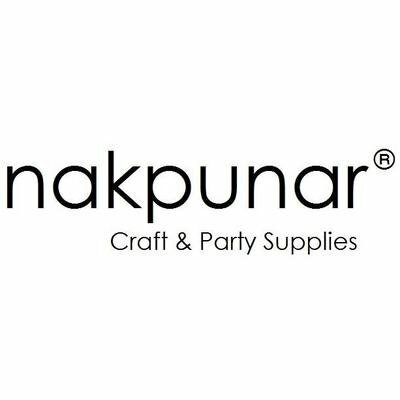 Of the items I have sold so far, I have chosen to roll them in colorful tissue paper which prevents wrinkling and then I add a sticker with my shop's name on it and other appropriate stickers. 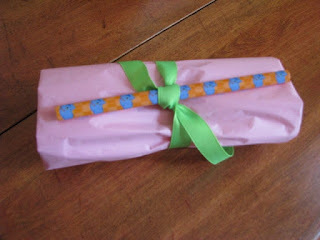 I have been adding a small child's gift with their aprons. 7.Your favorite 5 supply stores. I worked in Interior Design for many years and some of my fabrics come from there. I also have a daughter that lives in Virginia and I bought many of my supplies from an old schoolhouse called House of Fabrics. Locally we have a Hobby Lobby, and a JoAnn's. Thank you for this opportunity! I look forward to seeing who else is featured! What wonderful items.....and such attention to detail! The baby quilts are beautiful! Any child would be lucky to have one of those. The bibs are cute! And they look so soft! I love the ORANGE purse! I may just have to get that for myself. What a great shop! Adorable and creative items!!! And such organization and detail. I'm impressed!